The spindle (see picture 1) is perhaps one of the least understood parts of a lathe. It's the part which conveys the driving force to the workpiece - in essence, a carrier system. But without the aid of other fitments, it can do nothing. So the spindle has to be designed in such a way as to receive the motive force from the motor, usually via a pulley system called a 'Drive Train'. The spindle runs on bearings housed in the headstock which let it rotate freely. They also hold the spindle parallel to the lathe bed. 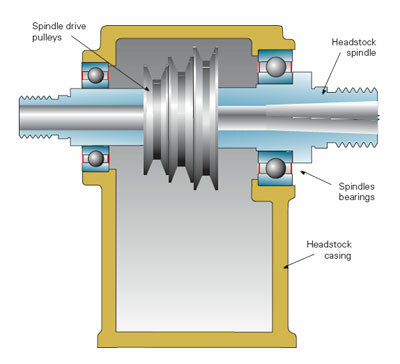 To drive the workpiece, one or both ends of the spindle carry various work-holding or driving devices, often a combination of an external thread and an internal tapered socket, but more usually a Morse taper. 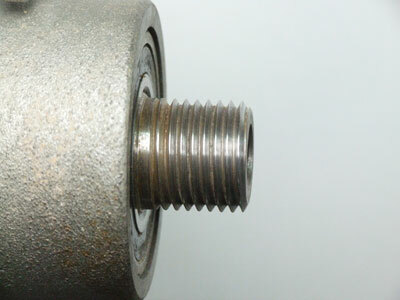 direct bearing on the lathe's performance, i.e. vibration, and dampening qualities. In the same way, a spindle must be robust, and resistant to flexing, and vibration. Indeed, failure to ensure adequate strength will cause the whole machine to perform poorly. A bigger spindle also lets you use bigger bearings, giving better running, greater load carrying, and longer bearing life. A large spindle also allows you to use a sturdier Morse taper, such as a No 2 MT or bigger. This gives a stronger grip, is less prone to slipping, and easier to clean. A larger spindle also allows a bigger thread and register, affording greater stability, durability, resistance to damage, and choice of holding options - but more of this in a later instalment. In short, BIG IS BEAUTIFUL. The fitting describes the method by which an accessory is externally attached, or 'fitted', to the spindle and, with few exceptions, employs a screw thread for this (see picture 2). The size of the thread is usually dictated by the size of the spindle, and can range from below 1/2in, (12mm) to over 1 1/2in (40mm). In addition to the thread, some means of providing a back stop is necessary, or the accessory would have nothing to stop it jamming against the headstock housing, or being thrown out of true at the end of the thread. To overcome this, a shoulder, or back register, is usually included in the spindle's design. This also provides another very important function, namely to 'register' the accessory against a flat surface in order to hold it square to the line of the spindle. A cheaper, less accurate alternative, is sometimes provided in the form of a simple lock nut, which is tightened against the rear face of the accessory. However, reliance on a screw thread, with or without a back register, is no guarantee against accessories rotating concentrically, and wobbly equipment on your spindle affects performance. 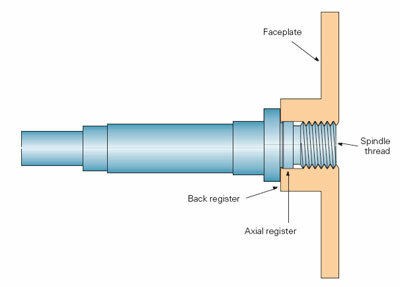 So, on better lathes, an axial register is introduced to 'register' or align the accessory on the true axis of the spindle. The most common and internationally used method of holding shank tools in the spindle is by means of a Morse taper (see picture 3). The idea is very simple - the spindle bore is matched with a corresponding taper on the shank of the accessory, and as the taper is very shallow, it creates a gripping or locking method through friction. There are other sizes, but these rarely occur on woodturning lathes. Only a few lathes have completely blank ends to the spindle, but several have threaded or plain holes in it. Unless accessories come with the lathe, there is little hope, or scope, to fit many of those available today. "Only a few lathes have completely blank ends to the spindle"